Out of a desire for breakfast that didn’t involve low-carb bread (Mark has trouble with his blood sugar in the mornings), and also out of a desire to try to work more veggies into my day, I concocted this dish last night, and made it this morning. This is a total winner — sweet from the pumpkin, savory from the ham, earthy from the greens and garlic, creamy from the egg. It’d make a terrific dinner as well as a great start to your day. Cut the miniature pumpkin in half, scoop out the seeds, and remove the stem. I recommend using a metal spoon to remove seeds from squashes — it makes it much easier. Place the halves cut-side down on a baking sheet and bake at 350°F for 30-40 minutes, until tender. If you want to make it more quickly, you can steam-cook the pumpkin in the microwave, in a baking dish with a little water in the bottom, but you won’t get the sweet roasted flavor. You can also make the pumpkin the night before and reheat it. The pumpkin halves are ready when a sharp knife inserted into them goes in very easily. While the pumpkin is cooking, dice the ham, slice the Napa cabbage, and mince the garlic. Set a pot of water to boil for the poached eggs, and, optionally, add a splash of white vinegar to it so the eggs will set quickly. Once it’s boiling, turn it down to a simmer, and wait. Get the rest of your breakfast or lunch together, empty the dishwasher, whatever you need to do. When the pumpkin is about 8 minutes from being done, saute the ham in a little olive oil until nicely browned. Add the garlic, cook until fragrant, then add the Napa cabbage and cook until just wilted. Remove from the heat, drizzle with a little lemon juice, and season with salt and pepper if desired. When the pumpkin is just about done (you can leave it in the turned-off oven to keep it warm), crack the eggs gently into the simmering water. For runny yolks, poach for 3 minutes (my fave!). For harder yolks, 4 or 5 minutes. 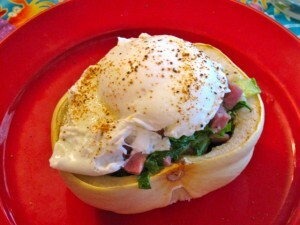 While the eggs are poaching, stuff the pumpkin halves with the ham and Napa cabbage mixture. If the pumpkins don’t stay quite flat, slice a little off the back to keep them level. Scoop the poached eggs out of the simmering water with a slotted spoon as soon as they reach the consistency you like. Top each of the stuffed pumpkins with a poached egg. Sprinkle with salt, cayenne pepper, and black pepper, and serve immediately. This recipe is easily doubled or tripled, just make sure you have a large enough pot to cook all the eggs. Enjoy!